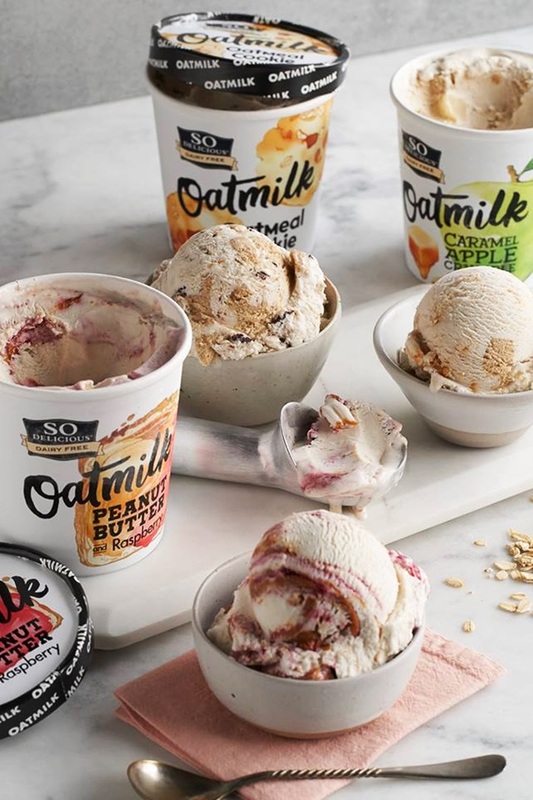 Breakfast meets dessert in the new pints of So Delicious Oatmilk Frozen Dessert. Each flavor is whipped up with smooth oatmilk and infused with several sweet ingredients. It’s an indulgent dairy-free ice cream that isn’t light on carbs, but does promise bold flavors. The initial launch of So Delicious’s Oatmilk Frozen Dessert includes the following dairy-free “ice cream” flavors. If you have tried any of these, don’t forget to leave your own review below to help others make an informed purchasing decision! This is the first flavor I’m personally hoping to find. 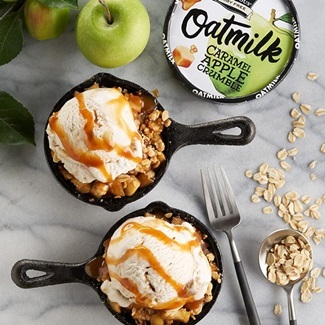 I’m a big apple crisp fan, so the apple, cinnamon, and brown sugar infused oat ice cream sound like a heavenly combination. 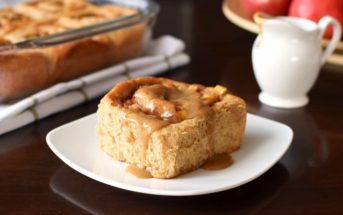 It’s swirled with a generous ribbon of caramel for an indulgent finish. Move over PB&J. This jammin’ flavor is made with smooth, creamy peanut butter and juicy black raspberries. It’s a decadent blend that might make you feel like a kid again! So Delicious decided to double down on the grains with this oat-rageous flavor. 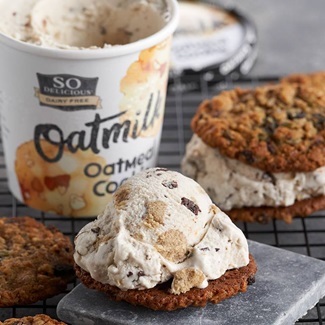 The dairy-free oatmilk ice cream base is spiked with chunks of chewy oatmeal cookie. And they didn’t forget to spike it with cinnamon! 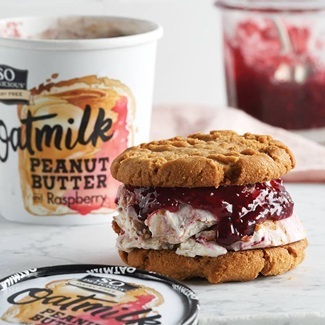 Availability: So Delicious Oatmilk Frozen Dessert is launching in the U.S. first. 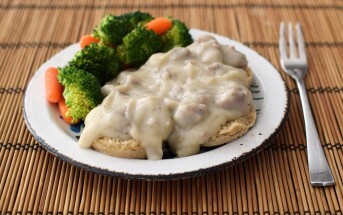 Look for it in the freezer section in natural food stores and mainstream grocers. Nationwide distribution is expected by the summer of 2019. Certifications: So Delicious Oatmilk Frozen Dessert is Certified Gluten-Free, Certified Vegan, Certified Kosher Parve, and Non-GMO Verified. 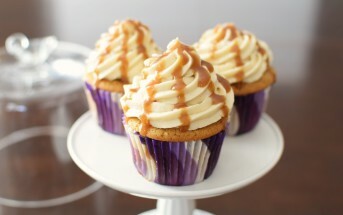 For More Product Information: Visit the So Delicious website at www.sodeliciousdairyfree.com. *Always read the ingredient and nutrition statement prior to consumption. Ingredients, processes, and labeling are subject to change at any time for any company or product. 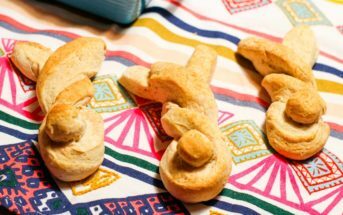 Contact the company to discuss their manufacturing processes if potential allergen cross-contamination is an issue for you. No food product can be guaranteed “safe” for every individual’s needs. You should never rely on ingredient and allergen statements alone if dealing with a severe food allergy. We bought the Oatmeal Cookie, since it seemed like a natural flavor for oat ice cream. It was loaded with big thick & hearty oatmeal cookie chunks and the ice cream itself was creamier than expected and pleasant enough. It was almost like a jumbled up ice cream sandwich. But somehow it just didn’t have that “I need another scoop” factor for our crew. My husband was very “meh” on it. My aunt, dad, and I all said it was “good” but we still have a half a pint left. Everyone had a small scoop to sample and that was it. With four sweet-tooth people like us, that seems odd. We’ll stick to their cashew milk ice cream for now – those always get polished off! Ok, so I LOVE SO Delicious, it’s the only dairy free brand I eat anymore. Personally, I am in love with the Peanut Butter and Raspberry ice cream. To me it felt like I was eating a pb+j, the perfect amount of sweet. I enjoying the flavor and texture of the Oatmilk, nice and creamy, not too sweet. I can’t wait to try the other flavors! I’m a big fan of So Delicious products but the Oatmilk products I tried are a disappointment. Maybe my tastes are just not refined enough? Because I’m a huge peanut butter fan, I first tried the PB&Raspberry and I thought it was disgusting. I couldn’t even eat a full spoon! I then tried the Oatmeal cookie…that was passable but the oatmeal cookie dough(?) chunks were bland at best. I’ll stay with the Cashew Milk flavors. Anthony is the technical backbone behind GoDairyFree.org, but he also acts as our Senior Editor and Chief "Meat Man" for recipes, reviews and news.